May 17, 2017 January 9, 2018 by Tara R.
During the mid-1940’s my grandfather worked at the Y-12 Plant in Oak Ridge, TN, as a machinist specialist. Oak Ridge was one of the sites where research and development was done for The Manhattan Project that resulted in the first nuclear weapons used by the U.S. during World War II. My grandfather, grandmother, mother and her four siblings lived in the city from 1945 to 1952. At that time, the city was gated and any cars entering or leaving the compound, were stopped and searched. The residents also lived under a curfew. Mom even had dog tags. Fast forward to 1965, when my mom and dad, my brother, and I moved to Oak Ridge, and my dad worked at the X-10 Plant. A designer, dad was instrumental in drafting prototypes for the Apollo 11 mission moon bags. When we lived in the city, the gates were down, but the guard houses were still standing. There was no curfew, but the infrastructure was a haphazard mess of road names that changed in the middle of the street, designed to be confusing to outsiders. Arguably, the original purpose of Oak Ridge was of enormous historic significance, but it also gave birth to a weapon of mass destruction that killed or maimed hundreds of thousands of people. 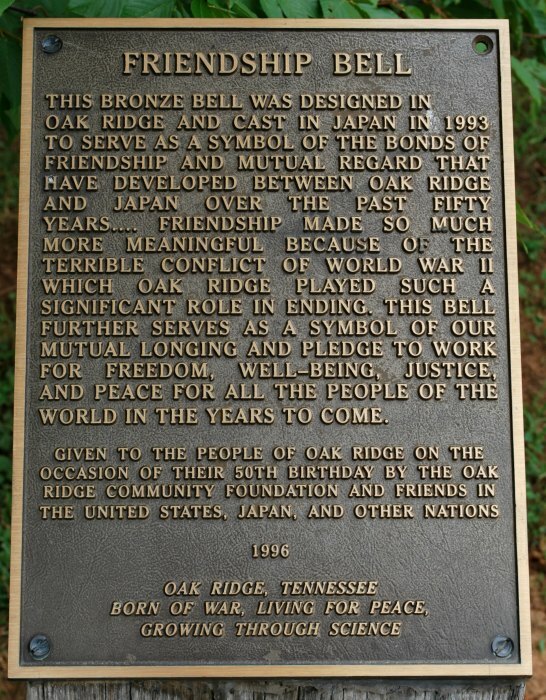 During the intervening years, Oak Ridge and Japan began to foster a new relationship… one of friendship and peace. In 1993, the city was gifted with a Friendship Bell from the Oak Ridge Community Foundation and the Friends in the United States, Japan. I love the idea of the friendship bell. It shows that forgiveness is possible and that everyone needs to move on. It’s great to learn about small towns through my friends in the blogosphere. Thanks for sharing Tara. Interesting that the Oak Ridge people didn’t know what they were developing until the bomb was dropped on Hiroshima. I still visit Oak Ridge… my mother lives near there. It’s a typical, small-town America sort of place. There are a few reminders of that time around town, but they don’t really dwell on that part of its history.